Is that guy’s hair real? It’s so long, do you think he sits on it every time he takes a seat? When was the last time he washed his hair? I’m sure there are things growing under all that mess! What would happen if you never washed your hair? 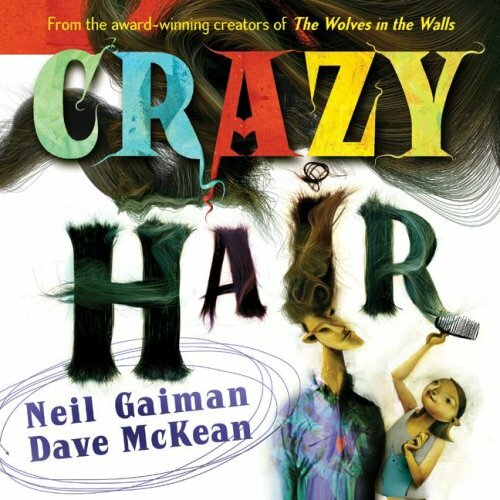 When a young girl insists on brushing a characters “crazy” head of hair, she is transported into a bold and mystifying world of animals, entertainers, and more; somewhere in the “crazy hair”. Gaiman’s text is rhyme à la mode — it has a contemporary groove to it that offers effortless enunciation. McKean’s illustrations are certainly at one with the words, offering beautiful creative images to further spur the imagination — not to mention the superb typography. Youngsters will be wondering, could this really be possible? Older kids will appreciate the absurdity. Adults will delight in the creativity this book wholly offers. This book is a feast for the imagination!